Although compliance standards can be helpful guides to writing comprehensive security policies, many of the standards state the same requirements in slightly different ways. 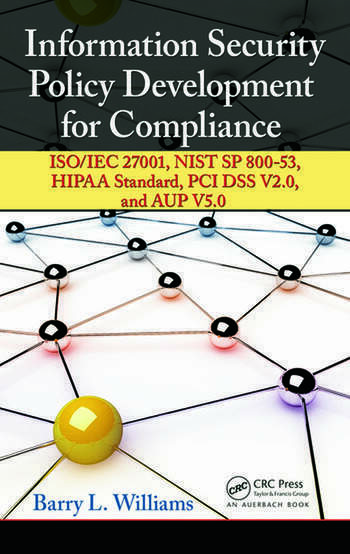 Information Security Policy Development for Compliance: ISO/IEC 27001, NIST SP 800-53, HIPAA Standard, PCI DSS V2.0, and AUP V5.0 provides a simplified way to write policies that meet the major regulatory requirements, without having to manually look up each and every control. 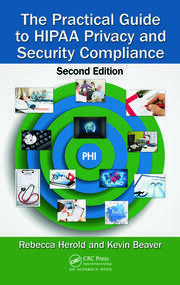 The book supplies you with the tools to use the full range of compliance standards as guides for writing policies that meet the security needs of your organization. Detailing a methodology to facilitate the elicitation process, it asks pointed questions to help you obtain the information needed to write relevant policies. More importantly, this methodology can help you identify the weaknesses and vulnerabilities that exist in your organization. 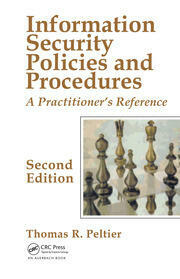 A valuable resource for policy writers who must meet multiple compliance standards, this guidebook is also available in eBook format. 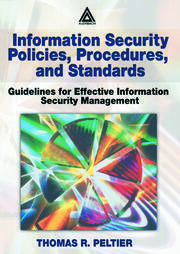 The eBook version includes hyperlinks beside each statement that explain what the various standards say about each topic and provide time-saving guidance in determining what your policy should include.